One of the most common emails we get is: I live in a hot climate. What seeds would thrive in my area? While I wish that every gardener could grow whatever variety they wanted, unfortunately that’s not the case. Here in the temperate Pacific Northwest, varieties that love the heat have to be grown in a greenhouse in order to thrive. Meanwhile, some of my flower friends who live in hot, arid climates aren’t able grow many of the most delicate treasures like sweet peas, foxglove and stock because their climate is just too harsh. I thought it might be helpful to share some of the easiest to grow cut flowers that can take the heat. If you live somewhere where the summers get hot and you are looking for some tried and true winners to plant into your cutting garden, here are some great suggestions for you. Amaranth: Amaranth is easy to grow and is a great choice for beginning gardeners. I have grown just about every variety of amaranth on the market, and while all make great additions to large-scale arrangements, there are a few varieties that I grow in abundance every year. My all time favorite is Green Tails (pictured above) because its long chartreuse tassels add texture and combine beautifully with both bright and pastel color palettes. Coral Fountain has the same growth habit as Green Tails but is the most exquisite shade of dusty pink that resembles sun faded velvet. Hot Biscuits produces abundant golden brown stems that add a unique textural quality to arrangements. It mixes well with just about everything. Basil: One of the most fragrant and abundant summer foliages in the cut flower garden is also a mainstay of the herb garden. Aromatto is the most stunning variety of all, sporting deep purple flowers, glossy foliage and a spicy licorice scent. Cinnamon, Mrs. Burns Lemon and Dark Opal are also great additions to both the herb and cut flower garden. Cut foliage is prone to wilting in the heat, so harvest in the coolest parts of the day and place directly into water to rest for a few hours before arranging. Marigolds are some of the toughest, hard working plants you can grow and make excellent additions to mixed bouquets. These garden workhorses benefit from pinching earlier than most, when they are around 6-8″ tall. We are doing a big marigold trial this coming year and I’m excited to see what we discover. Johnny’s Selected Seeds has a few great varieties available including Giant Orange and Giant Yellow. Celosia: These easy to grow, heat loving flowers come in a wide variety of shapes, colors and forms, ranging from a crested cockscomb that my kids call “brain flower” to spikey, plumed forms that are great accents for bouquets. I love them all. A few solid performers to try: Pampas Plume Mix, Supercrest Mix and our two new introductions Texas Plume Summer Sherbet Mix and Texas Plume Vintage Rose Mix. 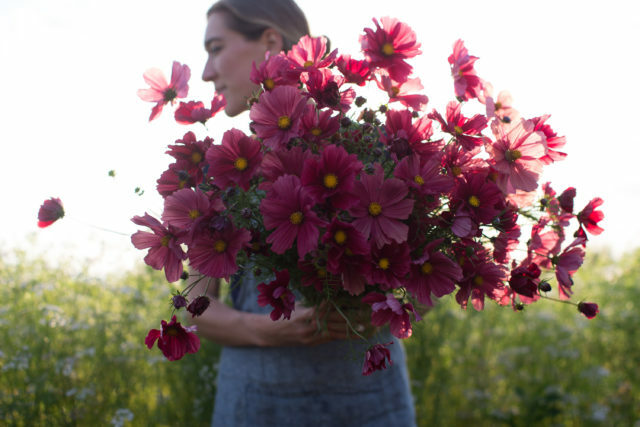 Cosmos: Of all the annual plants you can grow in your cutting garden, few are as productive as cosmos. They truly are a cut-and-come-again flower: the more you harvest them, the more they bloom. A single planting will produce buckets and buckets of daisy-like blooms for many months. Some of my favorites are the fluffy blooms of the double flowered cosmos from the Double Click Series and the rich, velvety flowers of both Rubenza (pictured above) and Velouette. 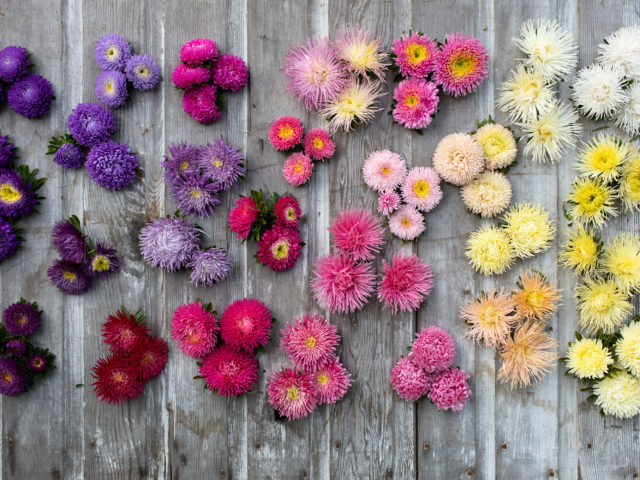 Globe Amaranth: These summer darlings have adorable, button-like blooms that look great in bouquets. They thrive in the heat, and the more you cut, the more they bloom. 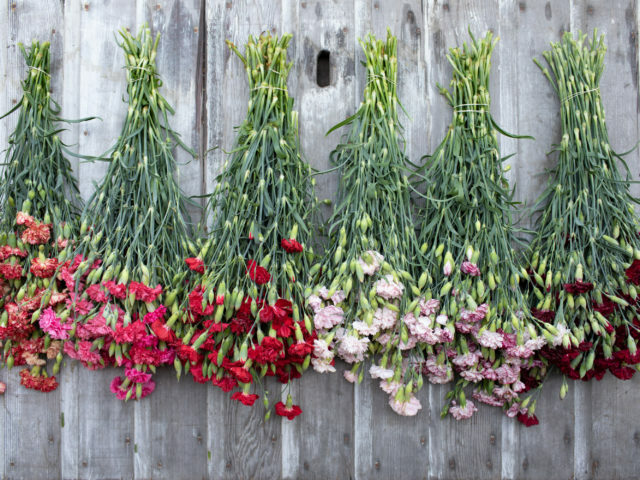 Freshly harvested flowers can last up to two weeks in the vase and can be dried and used for autumn projects and crafts. If you’re looking for bright cheerful colors, Sunset Mix includes magenta (pictured above), red and orange. If you’re drawn to the softer tones, Pastel Mix includes white, rose, soft pink and pale lilac. It’s perfect for wedding work. Hyacinth Bean Ruby Moon: This vigorous climber puts on a dazzling show from mid-summer to the first frost, making it a must grow for any gardener. Its eye-catching dark foliage is smothered in wine colored pea like blossoms. As the flowers fade, long stems covered in vivid, glossy plum seed pods appear. A unique, textural addition to bouquets, the rich color of these pods pair beautifully with almost any color palette. Orach: I discovered this fantastic plant in a friend’s veggie patch some years back and have been a huge fan ever since. Early in the season the leafy stems can be harvested for bouquets. The more you cut, the more it produces. Stems hold best when given a quick searing treatment directly after harvest. Just dip the bottom 2″ of the stems into boiling water for 10-15 seconds and then plunge into a bucket of cool water. If plants are left to grow on you will be rewarded with gorgeous seedy stems by midsummer that are a favorite with designers and are wonderful in bouquets. Seeded stems do not need any special post harvest treatment and often last 2 weeks. For a large flush of smaller, more usable stems, be sure to pinch plants hard at 12-18″. Succession plant every few weeks for an extended harvest. There are three main colors available including green, burgundy and a greenish-blush. Ruby Gold (pictured above) has eye-catching foliage which is a glowing acid-green and stalks are streaked with cranberry. Seeded stems are a blend of dusty rose and sun-bleached moss. 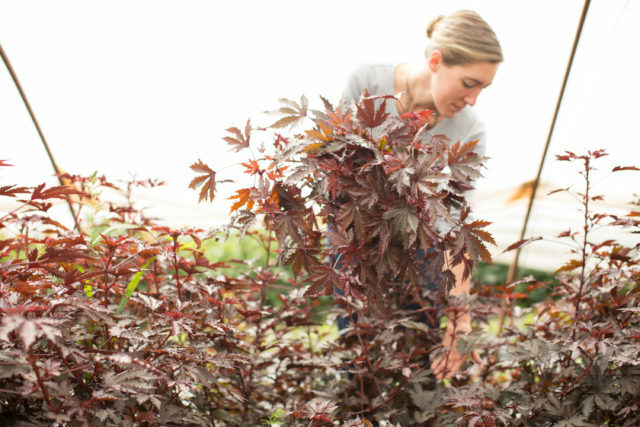 Red Leaf Hibiscus Mahogany Splendor: With dramatic deep burgundy foliage that resembles Japanese maple leaves, this plant provides great height to garden borders and adds drama to large container plantings. Grown primarily for its striking, serrated foliage, red leaf hibiscus only produces flowers indoors in temperate regions. The more you cut this heat and drought tolerant plant, the more it produces. Statice: Considered one of the best flowers to use dried, statice is also great fresh. Easy to grow, great for beginners and very productive, this versatile plant’s papery flowers bloom over a long period of time. Sunset Mix (pictured above) is a special mix of warm sherbet tones including peach, orange, apricot and pale creamy gold that combine beautifully with a wide range of color palettes. Pastel Mix includes cool tones like violet, lavender, blush, rose and mauve. If you’re looking for individual colors, we have a stunning icy Light Blue and Johnny’s Selected Seeds carries apricot, white, purple, rose and yellow. 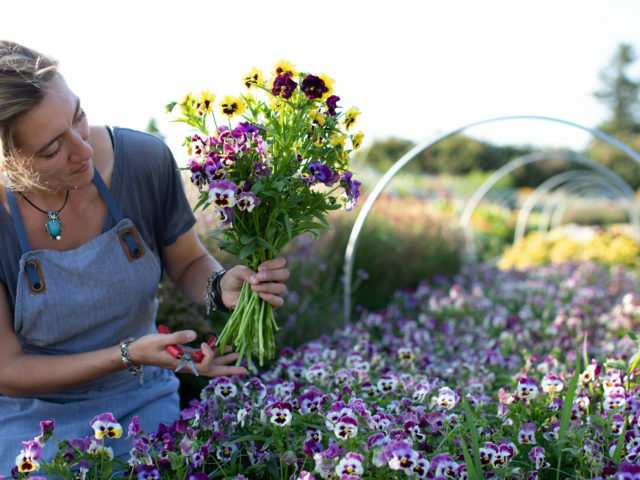 Strawflower: A versatile and textural addition to the cutting garden, strawflower can be used fresh and also dried for use in fall bouquets and wreaths. Also known as everlasting flowers, the color and shape of these papery blooms will last indefinitely when dried. Pollinators love them. If you’re looking for flowers in the pink tones, Candy Pink, Silvery Rose and Pomegranate are all stunning. I love Dragon Fire for its rich, nearly black blooms, but Apricot Mix (pictured growing above) will forever be my favorite. Ornamental Grasses and Grains: In addition to bringing visual interest to bouquets, grasses and grains are also drought tolerant, easy to grow and thrive in the heat. Some of may favorites grasses are Frosted Explosion, Broomcorn Millet, Bunny Tails and Feathertop. All are wildly productive and very easy to grow. Broomcorn Millet is an amazing textural ingredient for bouquets. Frosted Explosion is a true workhorse, cranking out buckets of stems every few days. Both Bunny Tails (pictured growing above) and Feathertop produce loads of soft, fluffy “blooms” that are loved by all. I discovered cress, a fantastic filler almost a decade ago have been a fan ever since. Just a few stems of these seedy treasures and every bouquet is transformed! We direct sow it in the spring, staggering 5 plantings about 2 weeks apart for an extended harvest. Fresh cress persists well over 10 days in the vase and any excess can be dried for autumn bouquets and holiday wreaths. Sunflowers: Sunflowers are the epitome of late summer-early autumn and look incredible displayed en masse or mixed with other blooms. Extremely productive, easy to grow and free flowering, these long standing favorites deserve a spot in every garden. I am partial to the novelty varieties of sunflowers that either have ruffled petals like Frilly, Greenburst and Panache or rich, ruby toned blooms such as Pro Cut Red and Ruby Eclipse. But when it comes to traditional varieties, nothing is more cheerful than Pro Cut Gold (pictured growing above) which has clear yellow petals and a fresh green center. Tomatoes: One of the best vegetables to sneak into bouquets, tomatoes look amazing tumbling over the edge of an arrangement. They are easy to grow, heat loving, vigorous and produce an abundance of fruit all summer and into autumn. They are sweet and delicious for eating too! Hands down, my all time favorite for arranging is Currant Red (pictured left) which produces an abundance of long stems loaded with miniature fruit. Zinnias: A cut flower garden wouldn’t be complete without zinnias. 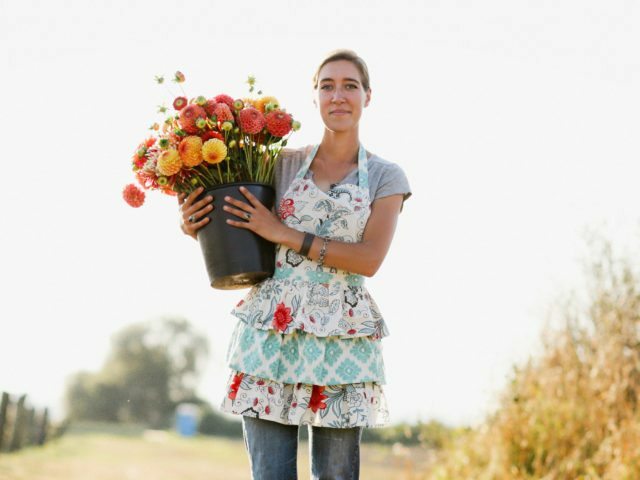 These fast-growing, easy to grow flowers are a staple of high summer bouquets. They come in so many different colors and unique forms, from simple single flowers to more unusual quilled, crested and pompon shapes. Heights can vary wildly, depending on the cultivar you choose. One of the easiest cut flowers to germinate, zinnias can be transplanted or sown directly into the garden, which makes them great for beginning growers. These reliable, prolific producers do well in virtually any climate and the more you cut, the more they bloom. I love all of the offerings available in the Benary’s Giant, Oklahoma and Queen series, plus the adorable Persian Carpet Mix (pictured above). I know it can be easy to feel limited by your climate conditions, but there are always varieties that will thrive in your neck of the woods. You just may have to work a little harder to find out what those things are. If you’re growing in a hotter part of the world, I would love to know some of your favorite varieties for cutting. Do you have any tried and true performers you’d suggest I add to the list? If so, please comment below. Note: if your comment doesn’t show up right away, please sit tight, as we have a spam filter that requires we approve most comments before they are published. I’m in Southern California, zone 9 (Sunset zone 21). Alstroemerias, euphorias (sear ends or dip in boiling water), New Zealand tea tree all are good cut flowers that do well in heat. Grevilleas are unusual and excellent cut flowers; look for long blooming varieties such as Robyn Gordon. The ornamental oreganos are the short side, but pretty. Kangaroo paws (Anigozanthos ) are large striking stalks with red, yellow, or pink flowers. Wax flowers and rice flowers give extremely long lasting blooms, great fillers. For foliage, the purple variety smoke trees are lovely. My current favorite grass is ruby champagne grass ( Melinus neriglume), and I live the glossy foliage of mirror plants (coprosma). I’m in Fresno area in California and marigolds and celosia make it through the 110-115 degree wether from may-sept/October. Thank you for this list, now I feel I can experiment with other flowers. Also, some roses make it through the heat, as well as some dahlias. This year I will be covering them with a shade cloth to make sure the edges of the flowers don’t burn. I make sure to water my flowers in the evening during the summer at least once a week. You should try a fall planting of cool season flowers to overwinter. Lisa Zieglers book “cool flowers” will help you out. Cheers. 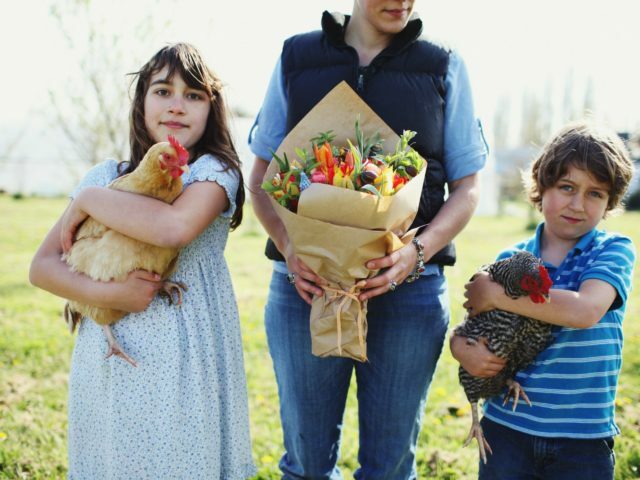 I live in Zone 5 on the eastern side of the Cascade Mountains from Floret Farm in Washington. Not so far away, but a very different climate from the west side. We have long, cold winters with deep snow and a short growing season of very hot, dry conditions – often 90F to 100F for weeks and weeks. It’s hard to grow flowers that prefer cool temps, like Larkspur and Sweet Peas, because it goes from cold to hot so fast with not much in between. In addition to the flowers listed in this article, I have found that Rudbeckias and Echinaceas do excellent in summer heat. They are wonderful hardy perennials in my zone that bloom profusely throughout the hot summers and are beautiful and long lasting in the garden and in bouquets. The pollinators love them too. addition to your soil. You only do this once, it doesn’t decompose, it just holds moisture and nutrients. I’m in zone 10 and here are a few others that do well for me every year: sweet peas (grown along the fence so they have shade part of the day), nigella, scabiosa, shirley poppies, cup and saucer vine, and japanese anemones! So helpful, specially because I grow in hot and dry climes of the med…..Thanks Erin! It’s always a great pleasure reading your letters! Many thanks for all your precious tipps! Any advice for the opposite up here in Zone 5 (Ontario)? You’ll find lots of varieties that enjoy cool weather in our Hardy Annuals section of the shop. I hope this helps! I live in central Victoria in Australia where the summer temperatures can reach the mid 40’sC (about 110F) and winter we get frosts to -5C (about 20F); together with poor soil it makes for challenging gardening. Cosmos, love in a mist and cornflowers all grow well and self seed for us. Salvias (particularly some of the newer heat hardy ones), thyme, zinnias and Verbena bonariensis are also good. I have tried Nicotiana mutabilis and it has survived its second summer with masses of beautiful flowers, if only it would set seed! Good luck with the hot weather gardening. We always had luck with Mexican Sunflower. It had to be dry and hot. Which sometimes isn’t the case in Ohio. Thank you so much for this post! It is VERY helpful. I live in the Yakima Valley, which is also in Washington State, but we have very different summers than you! 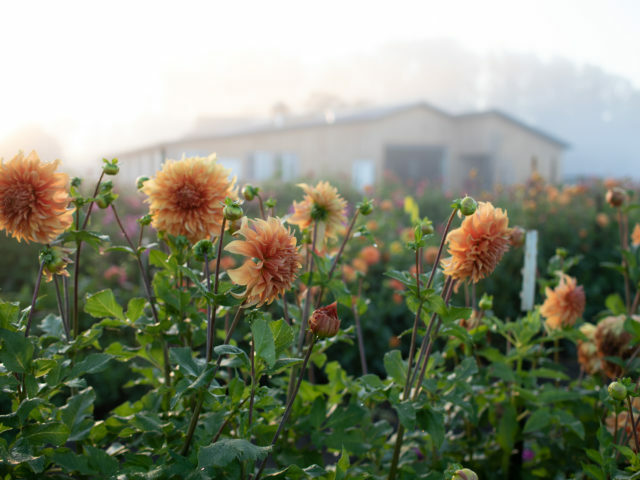 Hi Katy – can you share the dahlia varieties that you’ve had success with? Trying my hardest to grow in Texas! one of my favorites is Tithonia- Mexican Sunflower. Fabulous! I live in Texas and have had a lot of luck with geraniums, lilac and hydrangeas. I planted peonys last year and they did great. Growing for my first year in Georgia!! Thank you for the ideas and reassurance on some of the varieties I’ve chosen!! This is perfect! Thank you. We live in an area in Northern CA where summers are VERY hot. I’ve found I lose most flowers in the garden once the afternoons get over 100. This was a very helpful article, thank you! I live in Southern Arizona and it can be challenging to grow things. I have had success with your zinnia, double click cosmos, nasturtium, calendula, and sweet pea seeds. I have a backyard that faces North and East so it doesn’t get that harsh and hot afternoon sun. Thank you again, now I have more varieties to try! I’m in South Carolina. Hot as heck. Carnations are perennial and flower non stop here. The zinnias and celosia also go crazy and require little work. I’m trying cosmos this year. The dahlias are a challenge but there ARE varieties that flower well here and you don’t even have to dig them up in the fall! I live in St. Louis where our summers are very hot and humid. A couple of additions that I have grown here with success are Verbena bonariensis and Baptisia australis (esp. love it’s foliage in arrangements). I plan to try Nicotiana and Queen Anne’s lace this year. Also, considering Cerinthe. I believe they also do well in this climate. Thank you, thank you, thank you!!! I’m in Alabama and it’s HOT from late May through September. I’m starting a cut flower business right now. I’ll add the suggestions I haven’t already purchased to my list. BUT…I only have a half acre to plant this year. We have a total of 10 acres but I’m taking it slow. Thanks again! I live in Fl so this article was much needed!!! Thank you!! Im gonna try those this year! Cachae – It’s been a long time, but I think I planted sweet peas in October in Phoenix. I can’t say about stock because I didn’t grow that – I only went to admire it in the flower farms that used to line Baseline Road. All gone now, sadly. Julia- what time of year did you sow your sweet pea and stock seeds? I live in Scottsdale! Wonderful article Erin! I live in SC and I am very interested in what people in hot climates have been successful growing! Thank you for always having such wonderful information for flower lovers! You could add sweet peas and stock to this list if they’re grown in winter. Although I now garden in Northern California, I used to live in Phoenix, Arizona and I grew sweet peas every year, harvesting in late winter and early spring. Stock was grown in commercial fields in south Phoenix and the fragrance from acres of flowers filled the air.